There are different opinions as to the construction of this cathedral temple. Some believe that St. Sofia was built in the time of the Bulgarian czar Boris, others link it with the period of the reign of Czar Samuel. There are also some that link its origin with the time of Archbishop Leo, i.e., mid XI century when he came to Ohrid from Constantinople. Most probable is the last assumption, since the frescoes in the church were painted a few years before the death of the Archbishop Leo (1037-1056). The authors of the frescoes are unknown, but it is assumed that they came from Thessalonika. It had taken them several years to paint them. The best-preserved frescoes are those in the altar space. There, on the central apse a monumental figure of the Virgin Mary seated on the richly decorated throne with the Christ Child in her hands has been painted. Five angels approaching her have been painted from the left and right side. Below the figure of Madonna with Child is the composition “Apostles Communion”. It is one of the most interesting compositions in the church, showing Christ who gives his blessing with the right hand, while holding bread with imprinted cross in cryptogram in his left hand. An angel approaching him and six Apostles standing one behind another are painted one both sides of Christ. Also, the scenes “Christ Resurrection” and “Forty Holy Martyrs” have to be mentioned as paintings in the altar space. The former is one of the largest and most dominant compositions in the church. It is located on the vaulted altar ceiling and it shows the Apostles and the Virgin Mary led by the angels. The figures of the Apostles looking at the four flying angels who carry a medallion with the picture of Christ are shown on it. The elaborated details demonstrate the mastery of the fresco painters in this composition. The second composition consists of several cycles, dominated by the scene “The Freezing of the Sebastian Soldiers in the Frozen Lake”. It was painted as the central composition in the apse. Each figure was depicted with equal attention and the depth of their sufferings can be seen from the expressions on their faces. This legend was especially appreciated in Constantinople. During this period of Byzantine painting it was painted only in the church of St. Sofia in Ohrid. It is certain that in XI century, after the frescoes in the church of St. Sofia were finished, the icons were placed on the church iconostasis. The discovery of the icon dedicated to the forty Sebastian soldiers only supports the above mentioned. It was probably one of the icons that were kissed in the church St. Sofia. 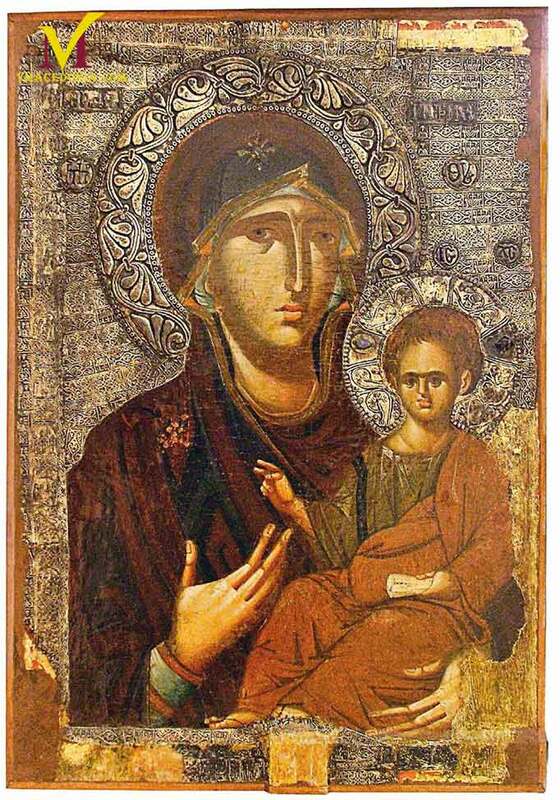 This icon, small in dimensions, is one of the oldest found in the region of Ohrid, and at the same time the earliest Byzantine icon with this motif. The cult of the Slav educators, St. Cyril and Methodius and St. Clement of Ohrid is obvious from the presence of their portraits in the Cathedral St. Sofia. They are located on the church’s southern wall, next to the iconostasis. It is assumed that artists from Thessalonika painted the frescoes since they are similar to those of the church St. Sofia in Thessalonika. Two extremely important icons, one portraying Virgin Mary and the other Archangel Gabriel also endow this period. Together they make up the composition “Annunciation”. The Russian scientist N. Kondakov who linked them to Archbishop Leo from Ohrid, and indicated that they date back from XI-XII century discovered these two icons. Another important icon, dedicated to St. Basil the Great and St. Nicolas, also dates from the second half of XI century. It was discovered in the church St. Bogorodica Perivlepta (St. Clement). 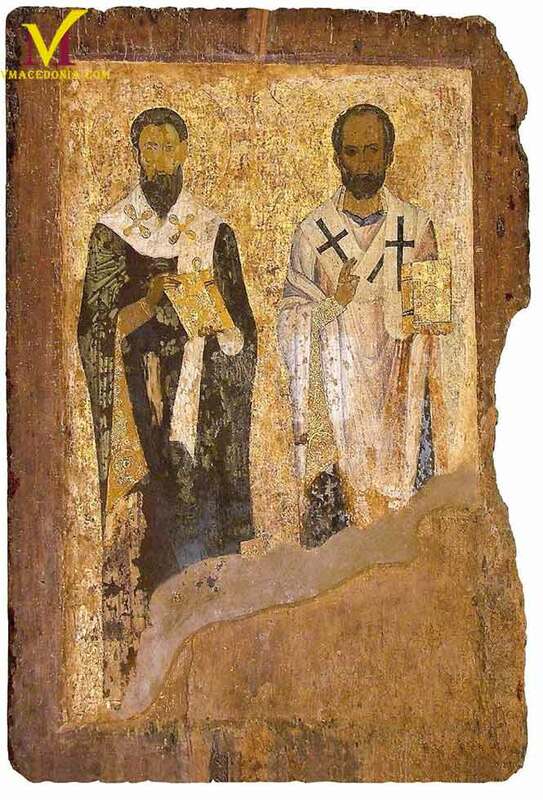 The icon is quite damaged, however it is evident that the painter was working in a style similar to the frescoes in St. Sofia. The Ohrid archbishops continued their practice of donating icons to the churches in Ohrid after their inauguration. This is evident from an Ohrid icon painted in 1262/63 portraying Christ. On the reverse there is an inscription saying that the donor was an esteemed Ohrid Archbishop by the name of Constantine Cavassila. The icon portrays Christ in half size, dressed in a brown garment, encrusted with gold. He has a halo, relief and ornamented plaster, above his head. It is assumed that a local painter made the icon. The Archbishop Cavassila was a gifted writer and theologian and thus a person of high esteem. As a result, his portrait was painted next to Clement’s in the church St. Bogorodica Perivlepta (St. Clement), in the frescoes of the churches St. John the Theologian – Kaneo and St. Vraci Mali. The old Komneni painting was present in the last decades of XIII century, which can best be seen in the frescoes of the church St. John the Theologian – Kaneo. This style in its essence is a conservative one and it is evident that it was based on the XII century painting traditions. There were a number of artists who painted in the Ohrid region towards the end of XIII century. They all belonged to different schools. A procession icon dedicated to the Virgin Hodigitria and the Crucifixion marked this period. This is a genuine masterpiece of the Byzantine easel painting. The Virgin was painted down to her waist. She is holding the Child in her left hand, pointing at Him with her right hand. The Virgin’s face is sad because she is aware of Christ’s destiny. 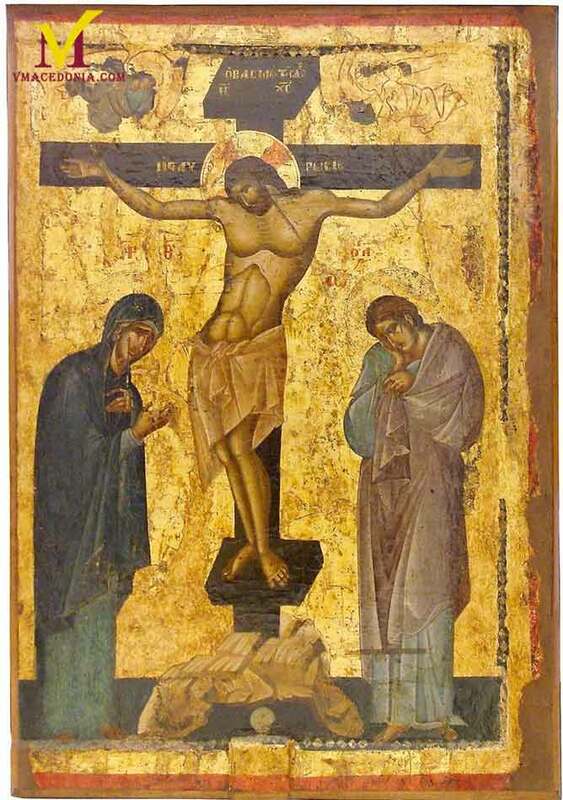 The other side of the icon depicts the crucified Christ with the Virgin and St. John underneath him in a position characteristic for XIII century painting. They are absolutely calm and restrained in showing their pain. It is assumed that numerous painters from various centres used to come to Ohrid on the invitation of the rulers and archbishops. During the last decade of XIII century two of these painters were contracted for painting the frescoes of the new church dedicated to St. Bogorodica Perivlepta (St. Clement). The Byzantine military commander Progon Zgur, a relative of the Emperor Andronicus II – Palaelogus, built the church in 1295. The fresco paintings of the church are among the best preserved ones from that period not only in Macedonia, but also in the whole Byzantine art. The fresco artists were Michael and Autychius. They incrusted their initials and signatures in several places. The perfectly preserved frescoes give an overall insight of the theological programme. The vaulted ceilings were used for painting scenes of Great Holidays. Below them are the scenes depicting Christ’s Life, the Miracles, and the Sufferings. The altar space themes relate to those of the liturgy, and the upper part of the apse contains the portrait of the Holy Mother, one of the most appealing and best-preserved work in the Medieval painting in Macedonia. Taking into account the popularity of St. Clement of Ohrid, the protector of Ohrid, the fresco painters chose one of the most appropriate positions in the church and portrayed him on the northern wall of the nartex. This portrait is considered the most successful medieval work of art because the painters succeeded to emphasis the Educator’s main features such as the nobility of his soul and the inner dynamics of his personality. That was the main characteristic of the paintings from that period by which they were distinguished from the works of the Thessalonica artists. Apart from that, the figures are treated more realistically. Only the icon of St. Matheus is of a larger format from all the other icons considered to be painted by Michael and Eutychius. They painted the whole figure of St. Matheus holding a book in his hands. He is half-turned to the left side, looking at the observer. Alongside this, there are a number of icons of a smaller size that are considered to be the work of these two artists, such as: “Doubting Thomas”, “Descend to the Limbo”, “Baptism of the Christ”, “Nativity”, and the damaged icon depicting the composition “Presentation of the Holy Mother”. In XIV century a number of important developments took place in a short period of time. One of them was the erection of the church St. Nicolas Bolnicki in 1312/13, also the parvis of the church St. Sofia in 1313/14, one of the greatest achievements in Medieval architecture, and finally one of the most important reconstruction of the monastery church of St. Pantheleimon together with the fresco paintings. Numerous important icons mark this period. Two liturgical icons are of a particular importance: one portraying the Virgin Saviour of Souls on the one side, and the Annunciation on the other side, as well as the one portraying Christ the Saviour of Souls on the one side, and the Crucifixion on the other side. Also dating from the first decades of XIV century is the church icon of St. Bogorodica Perivlepta. Later, in 1365, the composition “Presentation of the Holy Mother” was painted on the reverse side. This period in Ohrid was marked by the frescoes in the church Sveti Vraci Mali, while 1361 was marked by the construction of the church St. Bogorodica of Zahum and the frescoes in that church. Also the fresco painting and the construction of the church St. Bogorodica Bolnicka dates from the sixth and seventh decades of XIV century. This church probably was founded as a monastery for women. Also from this period there is a cave church near the village Pestani, dedicated to the Holy Mother, a church dedicated to St. Dimitry in the immediate vicinity of the church St. Bogorodica Perivlepta (St. Clement), the church of St. Constantine and Helen as well as Bogorodica Celnica.